Potatoes are one of the root vegetables that can be prepared and served in many different ways. From fries to potato fritters, croquettes, potato chips, roasted, baked, potato wedges and bread just to mention some examples. It's important to know the nutrition facts of these as well as other food stuffs and beverages that we put in our mouths. So one will find that fast food nutrition facts, soda nutrition facts and fruit nutrition as few examples are helpful things to know, especially if you want to eat healthy. This is because in a day or maybe a week you have had some form of fast food and a soda pop, and maybe, just maybe a fruit. Even if you have not had one, you need to know why you should. 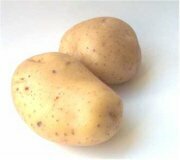 Potatoes, in particular roast potatoes are a good source of potassium. On an average, they can provide you with about 16% of your recommended daily allowance of the mineral. So what's so what does potassium do in and for our bodies? For one, potassium helps in the process of blood clotting when you have been wounded. This helps in preventing further blood lose. Potassium also helps in maintaining a normal blood pressure level. When it comes to Dietary Fiber, as the potato nutrition facts below shall show, potatoes are a good source of dietary fiber. It is known for it's aid in digestion in our bodies. However, research has found that it may also help in lowering blood cholesterol levels. Dietary Fiber also slows down the digestion of starch, thereby helping to keep the blood sugar level in the normal range. 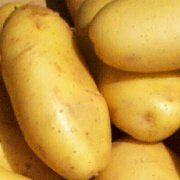 In addition to the above mentioned, that is Potassium and Dietary Fiber, potatoes also contain the following minerals, nutrients and vitamins; Thiamine, Riboflavin, Niacin, Vitamin B6, Vitamin C, Calcium, Iron, Magnesium, and Phosphorus. They also have some trace amounts of Zinc and Folate. The health benefits of potatoes come from these components we've just mentioned above. They each have an important role to play in the body. Dietary Fiber also helps in the prevention of colon cancer. If we want to get the best of these nutrients we need to be careful and not overcook the potatoes. We will now take a look at some potato nutrition facts. The percentage Daily Values (DV) are based on a 2,000 calorie diet. Your values may be higher or lower depending on your calorie needs. These nutrition facts on a raw potato show us that it is a good source of Thiamin, Phosphorus, Folate, Niacin, Copper, Iron, Magnesium and Manganese. Above these, it's an excellent source of Dietary Fiber, Vitamin C, Vitamin B6 and Potassium. We will take a look at mashed potato nutrition facts that have been home prepared with whole milk and butter added. We can see that they are a source of Vitamin A, Calcium, Iron, Zinc, Riboflavin and Folate. It is also a good source of Dietary Fiber, Vitamin C, Thiamin, Niacin, Vitamin B6, Potassium, Phosphorus, Manganese and Copper. However, the sodium, fat and saturated fat content is a bit on the high side and needs to be looked out for. These are nutrition facts for a red potato baked with skin. It does not contain any fat, cholesterol or saturated fat. It is also low in sodium and this is a good thing. Too much sodium may lead to hypertension which in turn may lead to other health problems such as heart disease. The red potato nutrition facts also show that it's and excellent source of vitamin C and Potassium providing you with 63% and 47% respectively of your recommended daily allowance. These nutrition facts are for potatoes that have been boiled and cooked in skin flesh without salt. 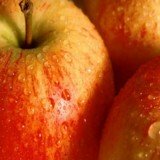 They are low in calories and are a good source of Vitamin C and Vitamin B6. Another good thing about these is that, like the baked red potatoes above, these boiled potatoes do not contain any fat or cholesterol. Baked russet potato nutrition facts with skin show that they are an excellent source of Vitamin B6, Vitamin C and Potassium. They are also a good source of Dietary Fiber, Iron, Folate, Niacin, Magnesium, Phosphorus, Copper and Manganese. A lot of kids and adults even love to have potato chips as snacks. But are they necessarily healthy? These potato chips nutrition facts are for those that are plain, made with partially hydrogenated soybean oil and are unsalted. Because they are unsalted, they contain a low amount of sodium, which is a good thing. It's also interesting to note that these potato chips are an excellent source of Dietary Fiber, Vitamin C, Niacin, Vitamin B6, Magnesium, Phosphorus, Potassium, Copper and Manganese. However, the downside to this is that the calories are way too high, as well as the total fat and saturated fat content. Follow this link if you may also be interested in healthy snack recipes for kids. 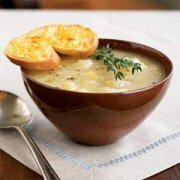 Cream of Potato Soup nutrition facts prepared with milk have shown that it contains quite a bit of sodium. If you want to be eating healthy you will need to watch out for this. It is however, a good source of Protein, Vitamin A, Calcium, Riboflavin and Phosphorus. Home-prepared potato salad nutrition facts reveal that it is mainly a good source of Iron, Riboflavin, Folate, Vitamin B6, Phosphorus, Potassium and Copper. However, the amount of sodium, cholesterol, saturated fat and total fat would be considered to be on the high side. Healthy bread recipes are a great tool to have under your belt. Potato bread may fit into that category, especially if it is made with whole wheat bread. 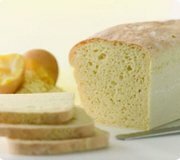 This particular potato bread nutrition facts have shown that it is a source of Iron, Calcium and Dietary Fiber. The calories are fair and it is also low in fat. Potato croquettes are delicious and easy to make. You may have them an appetizer or as part of a meal. When we look at these potato croquette nutrition facts we realize that they are fair in terms of calories and the amount of sodium. They also do not contain any fat, saturated fat or cholesterol. They are a source of dietary fiber, vitamin A and Calcium and a good source of Vitamin C and Iron. Leeks provide lots of vitamin C, vitamin B6, vitamin K, vitamin A, folate, iron, magnesium and fibre. The only downside for leeks is that for vegetables, they contain a larger than normal amount of sodium. 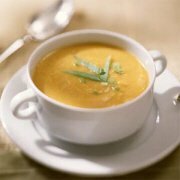 Soups depending on the way of preparation can be really great soul food. This soup is an excellent source of Vitamin C, providing you with 36% of your recommended daily allowance. It is also a good source of Dietary Fiber, Protein and Calcium. The potato roll nutrition facts reveal that it is slightly high in calories but low in fat and sodium. It however is a source of Dietary Fiber, Calcium and Iron. So there you have it, the nutrition facts of the various potatoes and the manner in which they are prepared. Whether you like potato chips, croquettes or fries, the decision is entirely yours as to what you will consume and how much of it, especially now that you have an idea of what constitutes each of them.